Okay, if you're like me, you loved The Iron Giant. It's one of the best science-fiction movies ever, a touching story of friendship and meaningful social commentary (both past and present, as discussed in this Wired article). It works great for both the YA crowd and adults. It garnered both Hugo and Nebula Award recognition. I loved the simple, hand-drawn animation. And even though we all cry when the iron giant gets blown to smithereens heroically saving the town, we cheer when we learn during the final sequence that he's piecing himself back together again. You know what that means? Right: The iron giant is part of a Berserker-like army of planet-killing monsters, and our Lovable Iron Hero™ participated in xenocide and planetary destruction on at least one occasion prior to visiting Earth. Only a knock on the head saved all life on this planet from his murderous programming. So, when he reassembles, will he be whole again? Following original programming? And thus destroying all life on Earth - maybe Earth itself? And what of the rest of the robot army? Are they on their way here, too, or maybe nearby, searching for their missing life-annihilating soldier? HOLY FINAL-MASS-EXTINCTION, BATMAN! Note that the movie dudes talk about this unifinished scene not as a bad idea or something they decided to cut because it WOULD CAUSE ETERNAL NIGHTMARES for the kids in the audience, but as an important part of the iron giant's back-story. So THIS HAPPENED, people. 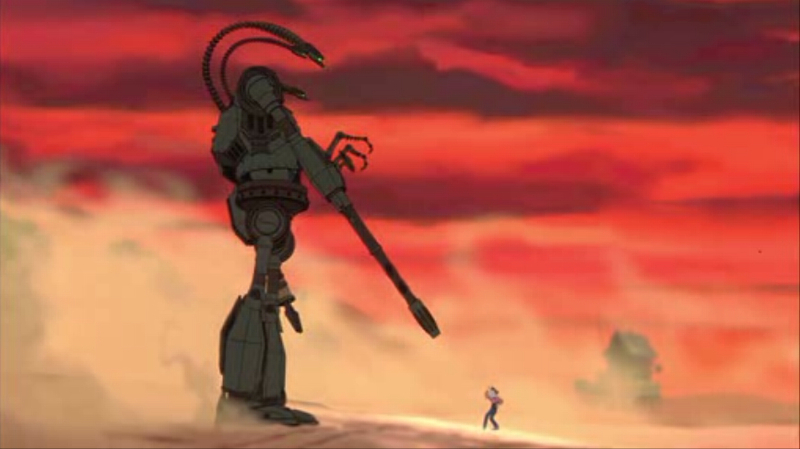 The iron giant murdered BILLIONS of life-forms - nay, TRILLIONS. And that's if he only destroyed one planet. And where is this army of life-hating Berserkers now? I'm assuming they didn't arrive in the 1950s of the movie's time, because our tech then would have ensured Earth's annihilation. Are they en route now? Could we hope to repel them using today's tech? Could the nations of Earth unite in time to defend our planet against such machines? I mean, nuclear weapons cannot destroy these monsters! They just disperse the parts until they can reassemble. Even if we could stop one, could we hope to stop AN ARMY OF INDESTRUCTIBLE MACHINES THAT ARE ESSENTIALLY SENTIENT, PLANET-KILLING GUNS? And even if our Iron Giant Hero™ were to retain his flawed programming and try to defend us, could he possibly hope to stand against an army of similar beings? Doubtful, even if his name was John Rambo. So I think we know why they never made a sequel. It wasn't because the movie flopped at the box office; something called The Iron Giant 2: The End of All Life on Earth wouldn't be quite the child-friendly film the audience might expect. I'll watch this movie in a different light next time, that's for sure. Author Monica Valentinelli shares an essay about the value of social media and how its presence and absence affects her writing. I have discovered pretty much the same things whenever I've taken a break from LJ/FB/Twit/etc, and I bet I'm not the only one. Unless you're seriously addicted, I don't think you need to go cold-turkey as Valentinelli did - a day or two off, and you'll discover whether you're addicted or not. Here's a trend I want to see continue: Judge Invalidates Human Gene Patent. Not only does patenting genes make no sense (What, those corporations invented the genes they've patented? Nonsense. ), but it also limits scientific research and throws up all kinds of ominous portents. If a corporation owns the rights to specific genes you carry in your body, do you trust them to behave innocently and for the public good? Um. Bravo, United States District Court Judge Robert W. Sweet! More of the same, the rest of you judges.